Roland Garros, Paris – The King of Clay has taken yet another step further to cement that crown en-route to the final of Roland Garros as the six-time defending champion ruthlessly ousted his friend and compatriot David Ferrer 6-2, 6-2, 6-1 under blustery and damp conditions on the red dirt of Philippe Chatrier in Paris. Going into the match, Rafael Nadal lead the head-to–head 15-4 and had won their last four meetings, all of which were on clay in 2011 and 2012 at Barcelona and in Rome. Statistics about Nadal were being thrown around as he had a 50-1 win/loss record at the tournament, he had only been broken once in the first round against Bollelli and in 15 sets of tennis, he has had only 17 break points against the serve. Today’s match offered even more – he has now lost only 35 games in the entire tournament and has just added another digit to his win/loss record at the tournament increasing it to 51-1. For David Ferrer there was the ultimate jubilation of reaching the semifinals for the first time at Roland Garros – a statistic which is very hard to believe given his success on clay during his career. Today served up the ultimate test for Spanish No.2 – 6-time Roland Garros champion, Rafael Nadal, who was eagerly awaiting him on the opposite side of the net. Success for Ferrer during his career has been achieved over the years against the Spanish No.1, but never consistently and he knew he would have to adapt his strategies accordingly. 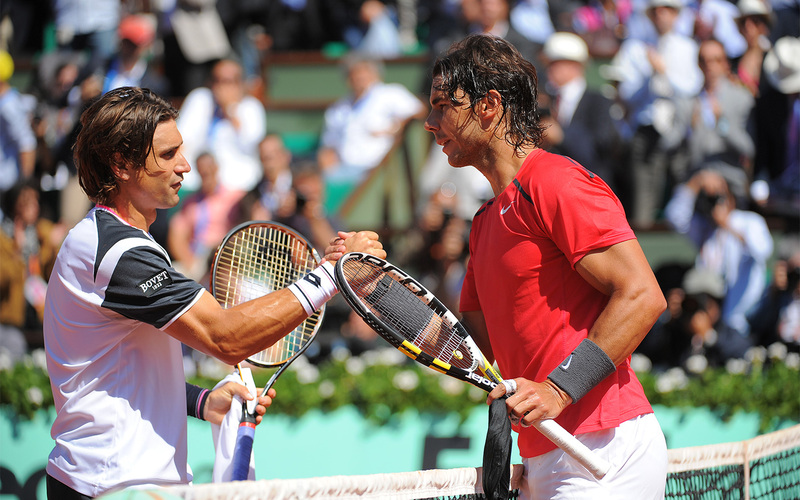 Ferrer is the ultimate wall, a great defender and very constant – and he knows Nadal’s game very well. Adjusting a style of play is never easy for a player, but to accomplish success against a great player like Nadal, it was something Ferrer knew he would have to do. He had to be extremely aggressive from the onset and outside of his comfort zone – using aggression form the first ball and take on the second serve, a meter or so inside the baseline and today, this proved to be easier said than done. On court today for Rafael Nadal, it was another day at the office and he opened up the court and exploited the lines beautifully barely allowing Ferrer to play. He ran his opponent around, dominated the rallies, bossed the tempo on court and repeatedly won the battle of the baseline, preventing Ferrer to play above his limits. At the start of the match Ferrer was prepared to do that and initiated his tactics beautifully as he took the ball on the rise, dictated with his forehand from the baseline, going up the line into Nadal’s backhand and was determined to stay with him. He had his opportunities to break, but Nadal soon warmed up and switched into demolition mode and refused to allow Ferrer to dictate play and took the first set 6-2. At the start of the second set world No.6 David Ferrer switched to a bright pink shirt – even more vibrant than Nadal’s after losing the first set 2-6. Maybe it was a ploy to blind and dazzle the dominating play of Nadal or simply a hope that a change of shirt will bring a change of luck? 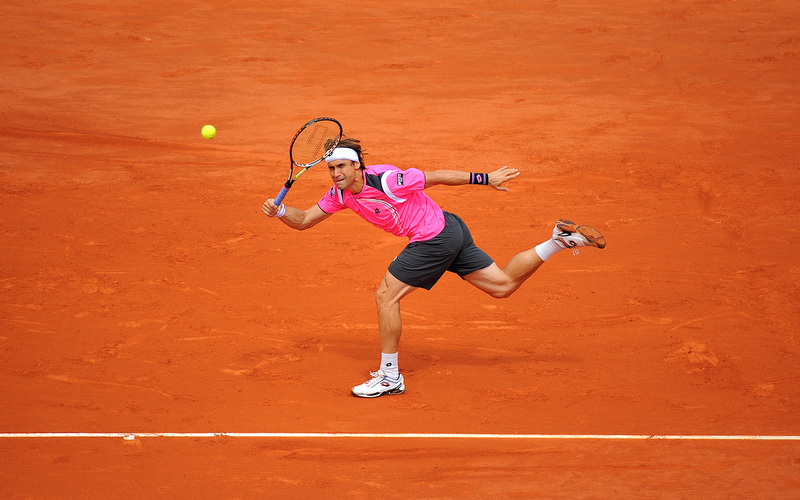 Even the rain delay did not help Ferrer’s cause. Either way, Ferrer saw the second set fly by as quickly as Nadal’s wraparound forehand. With little else left to try, Ferrer would not have been blamed if he tried to kick over Nadal’s perfectly placed water bottles – what other tactics (clean or dirty) were there left for him to utilize?! Nadal’s shots and serve continued to be difficult to read and predict as he continued to pummel the ball with heavy topspin firing from both wings and his footwork as always was something to be admired, as his open stance position on both wings made it nearly impossible for him to fail to chase down balls. Within an an hour and three-quarters the Spanish No.1 took the third set 6-1 and in doing so, he has reached the final of Roland Garros for the seventh time in eight appearances and his dreams of lifting the trophy for a record-breaking seven times are still firmly alive. Nadal has been a ruthless assassinator against his friends or rivals during his quest for Grand slam victory and during his destruction of Mónaco’s game he felt the best way to show respect for his friend and opponent was to continue playing his best – I wonder if Ferrer and Mónaco would have preferred a different way for him to show his respect?